Please Note: I have no connection to Lyn MacDonald & NZBR. Here you will get full honesty. Bird Boarding. Lost and Found services. Rehoming Services. With strong conditions to be met. If you find a tame bird Please do not hand it in to NZBR. They do not advertise birds handed in to them. And do sell them off. Even Fair Go has had them on about this. I promise I will do all I can to see them reunited with their owner. If you are looking for someone to care for your birds for any reason I am able to help. I have a natural ability to connect with the birds. I have one of NZ's best Avian Vets close by if needed. I personally have a free flight home with Cockatiels, Eclectus, Alexandrine. And I will do a complete check on anyone who wants to adopt to ensure that a bird is going to the best home possible. And they will be asked for home check and sign an agreement. Thanks so very much of taking such good care of him. You have to genuine love for these little creatures eg birds. People who love and are good to animals birds etc etc. Jack 15yr Sulphur Crested Cockatoo. Jacks pics and vids are here. I contacted Clive for help after making the difficult decision to rehome one of the IRNs I own. He made the daunting task bearable and was supportive throughout. He has put me in touch with a suitable owner for my precious IRN and I am confident they will give her the life she deserves. Thank you very much. Clive has now looked after my pekin duck Willow twice, and we have been amazed with how Clive interacted with Willow. Willow is often unsure around other people (that are not part of his family), but Clive was gentle with Willow and very quickly gained his trust. Willow thoroughly enjoys going to stay with Clive and always comes home content and extremely happy. Clive has a way with all birds. We feel very comfortable leaving Willow with Clive, & would never consider taking him anywhere else. We can't speak highly enough of Clive. He looked after our two canaries for several days, one of which has a stomach mass and her future was not looking too bright. Not only did Clive take good care of them, he sought advice from his own avian vet for us, changed her meds, and she's doing so much better! While she's not necessarily out of the woods, both canaries seem healthier and happier after their stay. Very obliging and friendly service. Thanks so much Clive!! Thank you Clive for looking after Ziggy my Rainbow Lorikeet at Labour Weekend for 5 days. Thanks also for arranging branches throughout his cage, much appreciated by Ziggy and of course me. I recommend Clive to anyone needing to board their bird, he has so much knowledge about birds that even I learnt quite a lot. Clive looked after my Sun Conure Poppy for 2 weeks over Christmas. Poppy hates men and I was unsure how she would get on with Clive. Of course Clive is no ordinary man and Poppy was very quickly in love with him! 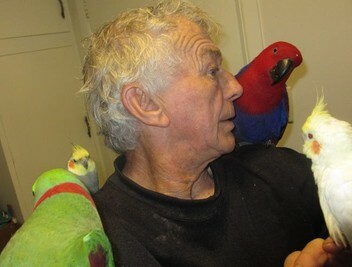 Clive really has a way with birds and is very experienced, confident and caring. He has a brilliant set up and I think most of the birds think they've ended up in paradise. I couldn't think of anyone better to look after my bird!